There is nothing quite like getting a brand new gizmo to play around with, but more often than not we are sometimes confronted with unforseen circumstances that do a number on our new purchase, including a lightning strike during a vicious storm that knocks out our favorite gizmo. Apart from that, there is always the danger of spikes in the local power grid which could throw our gadgets off course after a while, which is why the ElectroMan Surge Protector comes in handy. The ElectroMan Surge Protector is a hideous vision into our potential future. Look at his smiling face – happy to provide you with power. Look at his glowing heart – happy to protect your four electronic devices from surges. Look at the cord coming out of his head – ok, don’t look at that; it’s a little weird. But think of how happy you will be plugging your doodads into the ElectroMan, and think of how happy he’ll be to power your goodies. Happiness and surge protection in perfect combination. ElectroMan Surge Protector’s smile proves it is so. 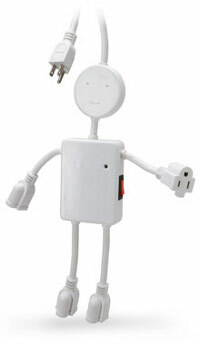 All you need to do with the $19.99 ElectroMan Surge Protector is to plug in his head cord and he’ll offer surge protectory power straight from his hands and feet, automatically transforming turning one grounded outlet into a quartet.